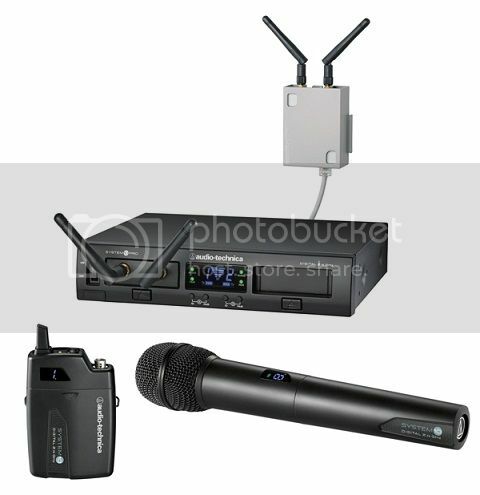 The new Audio-Technica System 10 PRO digital wireless system (not to be confused with the System 10, released a couple of years ago) offers numerous advanced features, including dual channel units, the ability to remotely locate the receivers/antennas, rack-mounting, and a total of 10 units that can be used together. A durable metal body, half-rack-sized chassis unit can house two receiver units, and the receivers can also be located up to 328 feet away from the chassis, linked via standard Ethernet cable. Each receiver comes with a remote housing that also allows it to be securely wall mounted. Because the antennas are located on each receiver, this allows the user to place them in an optimal position while securing the chassis in a rack. In addition, up to five chassis (10 receiver units) can be linked using an included RJ12 cable, creating a multichannel system with simultaneous use of up to 10 channels without the need for frequency coordination or group selection issues. The System 10 PRO operates in automatically selected frequencies in the 2.4 GHz ISM band, providing digital 24-bit/48 kHz wireless operation. Every time a receiver/transmitter pair is powered on, they automatically select clear frequencies and also have the ability to change transmitting frequencies automatically during power-up or performance if interference is encountered. Three levels of diversity assurance are provided: frequency, time, and space. Frequency diversity sends the signal on two dynamically allocated frequencies for interference-free communication. Time diversity sends the signal in multiple time slots to maximize immunity to multipath interference. Space diversity uses two antennas on each transmitter and receiver unit to enhance signal integrity. Systems are available configured as either single- or dual-channel, and with handheld and belt pack transmitters (or one of each). My test unit was the ATW-1312 package, which includes two ATW-RU13 receivers, and one ATW-RC13 chassis, ATW-T1001 UniPak body pack and ATW-T1002 Unidirectional handheld. Also included are receiver mounting brackets, a joining plate (for dual-channel systems only), an RJ12 cable, an AC adapter, and an AT8456a Quiet-Flex stand clamp for the handheld transmitter. Out of the box the first thing I noticed is the ruggedness of the dual-receiver chassis. Because it’s a half-rack unit, up to four channels of wireless can now be had in a single rack space. If you're constantly running out of rack space (like me), that's a great feature. The receivers easily plug into the chassis, and pop out by pushing a button. 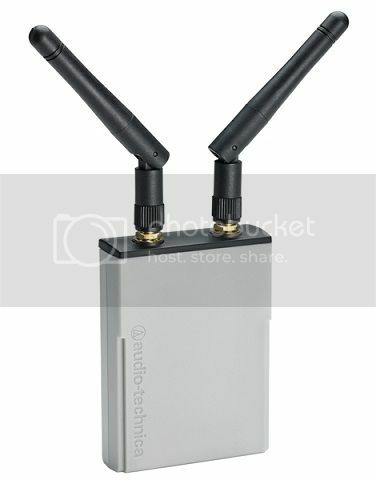 And as noted earlier, the receivers and their antennas can be remotely mounted with the included holders that are designed to mount to a flat surface like a wall, but I’m sure the more resourceful types among you will have no trouble adapting the housings to fit on a microphone stand or other support. The bottom line is that it's no problem to mount them for line of sight with the transmitters. Operating in the 2.4 GHz, there's no concern about TV station interference or other production wireless systems. Note, however, that routers can generate interference, so it's best not to locate the receivers within about 30 feet of a wireless access point. The ATW-T1001 body pack is light but the plastic body is rugged, taking a pair of AA alkaline batteries. My system was supplied with an MT830cW omnidirectional condenser lavalier mic, with headworn, instrument, and guitar cables also available from A-T. The ATW-T1002 handheld transmitter is also powered with dual AA alkalines. I really like the recessed single switch at the base of the mic in helping to thwart inadvertent muting or turn off. Hooking up the system was a breeze. The rear chassis offers both XLR and 1/4-inch outputs as well as output volume, a ground switch for each channel, and a power supply jack. There are also jacks for running the receivers remotely and for linking up the units. The very skinny wall-wart power supply does not block adjacent outlets. The front of the chassis includes a power switch, central screen, pair and ID buttons, and the two docks for the receivers. It was easy to pair the receiver to the mic. Assign the channel an identity from 1 to 10, press the pair button on the receiver, then press the pair button on the transmitter within 30 seconds, and they link. The screen displays RF strength, transmitter battery strength and signal with clip light. Having evaluated the body pack in a previous Road Test, this time I focused on the handheld transmitter. It’s a nice looking unit with a plastic body, and feels comfortable in the hand. The element is dynamic with a cardioid pattern. The transmitter is rated at 10 mW of output, with battery life for normal usage rated at 7 hours. There's a window on the side of the body that displays the ID channel as well as LEDs for active (green) and mute (red). Unscrewing the battery cover reveals the pair button and adjustable input level control. A small screwdriver is provided that stores in the transmitter (same for the belt pack) to adjust the recessed input trim. The mic sounds very good, with excellent off-axis rejection. While it's stated as a cardioid, I found the pattern to be a little more narrow, which I like. I tested the range in my shop and had no dropouts even with rows of loaded pallet shelving in between the transmitter and receiver. Satisfied that everything was working correctly, I packed up the system and took it out to a few shows. First up was a day-long trade expo at a hotel ballroom with a variety of entertainment, including comedians, game shows, solo and duo acoustic artists, and bands. We employed the System 10 PRO as the main announcer mic, also providing it for the comedians and the lead singers of the bands. The mic sounded great no matter who used it, including folks who "cupped" the mic head. After five hours we still had a bar of battery life left, but swapped in fresh batteries because it was a 10-hour event. A few performers stepped into the audience area in front of the main PA during their sets but there were no issues with feedback. Next we utilized the System 10 PRO with a female singer at a fundraising concert. Her repertoire consisted of everything from ballads to show tunes to pop and rock. At sound check it was easy to get a good sound with her voice and it required way less EQ than the hard-wired backup mic placed onstage "just in case." She commented on the great sound quality, and the RF performance was rock solid. Finally, we used the system as the primary announcer mic at the Live Sound Loudspeaker Demo at the recent USITT show in Cincinnati, held in a very large ballroom at the downtown convention center. A quick scan of the airwaves showed that the 2.4 GHz spectrum was extremely crowded (like it is at every convention center), so we decided to remotely locate the receiver and antennas a bit closer to where I would be using the mic. The receiver/antenna unit was attached (with gaff tape) to an upright drape pole on an exhibitor’s booth, linked via a 30-foot Cat-5 cable to the chassis at front of house. We didn't have any drop-out issues until I was more than 100 feet away from the receiver, which was more than enough distance to walk around the area and present the loudspeakers to the audience. At a standard gig, the receiver would be located next to the stage, with the transmission distance at about 40 feet or so. Some of the participating manufacturers also used the system during their individual demonstrations, which generated nothing but compliments regarding the sound quality. It's hard to think of a tougher test for a digital wireless system than operating in a packed downtown convention center with dozens of discerning audio professionals on hand. So if you're looking for a versatile wireless system with high sonic quality and solid RF performance, and at a price that won’t break the budget and still capable of problem-free operation after the next round(s) of FCC spectrum auctions, then put the System 10 PRO at the top of your list. U.S. estimated street prices: $429-$899, depending on configuration.